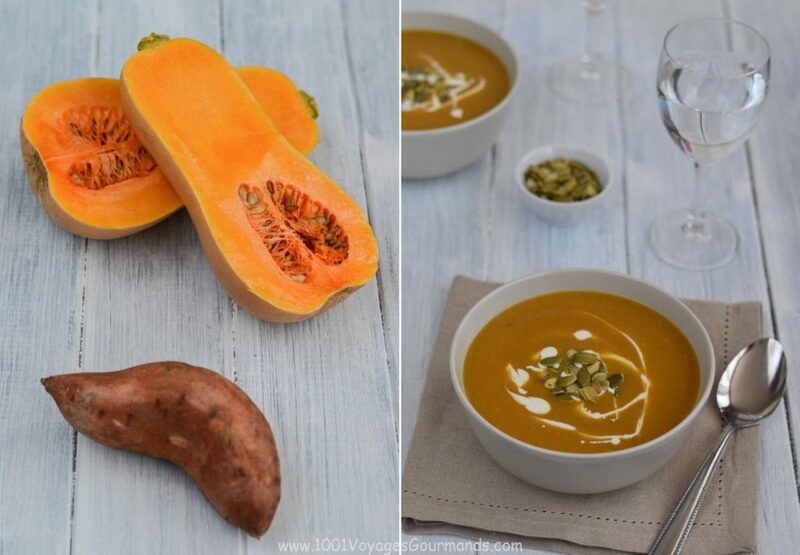 This delicious and silk Butternut Squash and Sweet Potato Soup is another nourishing soup of shiny orange colour that warms you up during the winter months. Sweet flavour of butternut squash goes well with sweet potato and the cinnamon adds a bit of exotic touch. It is so easy to do – you peel and cut the squash and potato, put everything in a pot and cook for few minutes, purrée, add the cream and seeds and you can serve! If you like to prepare lunch to take away for the week days, just freeze the soup in small portions that you can take out in the morning. Butternut squash is part of the pumpkin family and differs from the others by its funny shape, easy preparation (it is quite easy to peel and has fewer seeds inside) and sweeter taste. This tasty goodie is poor in calories and contains some vitamines such as A and B6. 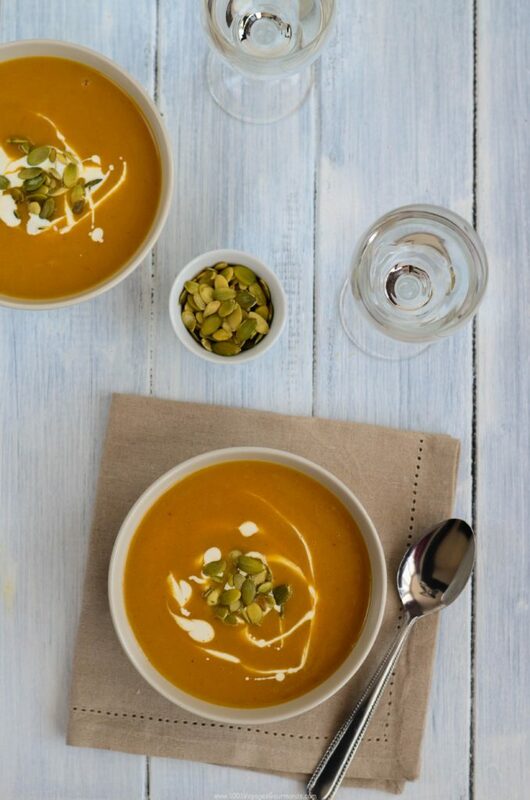 Butternut squash makes a nice couple with sweet potato thanks to their similar sweet taste. These orange potatoes are one of the most nourishing veggies – they contain a good amount of good quality carbohydrates, fibre and beta carotene. Peel the butternut squash, halve lengthwise, get rid of the seeds and chop into cubes. Peel the sweet potato and cut into cubes as well. In a large saucepan, heat the butter on a medium heat and fry the onion until golden. Add the cubes of butternut squash and sweet potato, fry for a while and then pour in the vegetable stock. Season with salt and pepper, cinnamon and nutmeg, bring to boil. Boil for 15-20 minutes (until the vegetable cubes are soft enough), then remove from the heat and mix all using a hand mixer. Serve decorated with cream and pumpkin seeds. If you try the soup, please let me know whether you like it via the comments below the post! 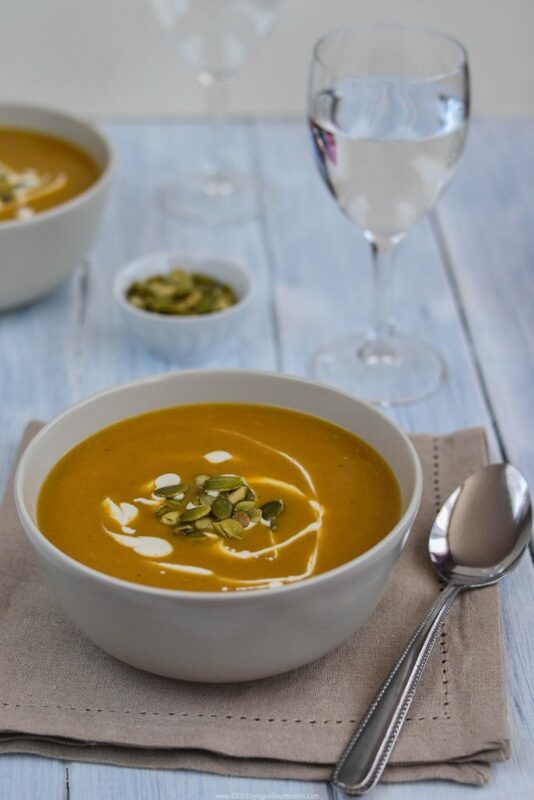 And if you like nourishing soups of orange colour, then you need to try also the Simple Pumpkin Soup or the Creamy Carrot & Boursin Soup!